Take a backroads trip up Mount Lemmon Scenic Byway near Tucson, Arizona. Our drive up one of the most scenic drives in southeast Arizona made for a perfect day. After several days in Tucson in over 100 degree heat in May, we really needed a break. Mount Lemmon has a summit elevation of 9,156 feet and is the highest point in the Santa Catalina Mountains, located in the Coronado National Forest north of Tucson. The 27-mile Byway is the biological equivalent of driving from the deserts of Mexico to the forests of Canada! Just imagine! As gardeners, Stu and I were fascinated by the changes in plant life! Mount Lemmon Scenic Byway is about an hour’s drive from Tucson, Arizona. The Byway starts on the east side of Tucson and crosses suburbs for several miles. Once you reach the road, the landscape changes abruptly to dense forests of saguaro, palo verde bushes and other cacti. As you start up the mountain, every turn in the Byway reveals something new! As the road begins to climb, it runs alongside the steep Molino Canyon which boasts a stream that forms waterfalls and cascades in the spring. At 4,000 feet, the cacti are replaced by open grassy hillsides and the first of five campsites. The next 1,000 feet give way to rocky slopes bearing yucca and small bushes, leading into the end of Bear Canyon yielding patches of pine and oak woodland. There is a second campground and a picnic area at this point of the drive. From there, the road switchbacks southwest and ascends to a grand overlook at Windy Point (6,600 feet). Then the road suddenly turns back northeast and travels a chaparral zone covered with bush. As you round the coming curve, there are dense woods with ponderosa pine and patches of aspen. That vegetation remains the rest of the 15 miles to the top of Mount Lemmon. There are plenty of turn-outs for scenic overlooks. We took hundreds of photos! Aspen Trail and Marshall Gulch Loop Trail (rated moderate) located in Butterfly Peak Natural Area located in Coronado National Forest. Romero Canyon Trail and Romero Pools Trail (rated moderate) located in Catalina State Park. 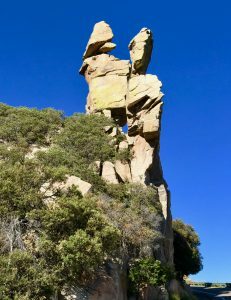 Wilderness of Rocks Trail Mount Lemmon (rated moderate) located in Santa Catalina Natural Area. Butterfly Trail via Crystal Spring Trail (rated moderate) in the Butterfly Peak Natural Area. Sabino Lake (#30), Creek Trail (#52), Rattlesnake Trail (#50) and Esperero Trail (#25) located in Pusch Ridge Wilderness. Meadow Trail #5A located in the Coronado National Forest. Seven Falls via Bear Canyon Road located in Sabino Canyon. Sunset Trail located in Pusch Ridge Wilderness. Sabino Tram Trail located in Sabino Canyon. Romero Ruins Trail located in Catalina State Park. Molino Canyon Vista to Ridgeline located in Coronado National Forest. See the entire list of trails at AllTrails.com and search for Mount Lemmon, Arizona. Mount Lemmon is a perfect place to hike, camp, fish, do some birdwatching or ski in the winter. We saw countless very fit bicycle riders and rock climbers. 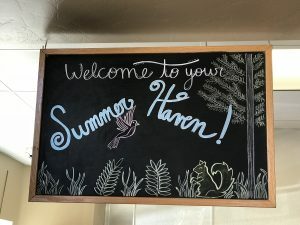 The town of Summerhaven is delightful with a General Store for an ice cream treat. Lunch is tasty at the Sawmill Run Restaurant where an outside terrace looks out over the mountains. Sitting under a terrace umbrella, we found the food really good! We photographed each stage of the Mount Lemmon trip and stayed up top for some birdwatching! To reach the Mount Lemmon Scenic Byway from Tucson, take East Tanque Verde Road to East Catalina Highway. Catalina Highway is a toll road for activities such as camping, hiking or even to use the restrooms. When approaching the toll booth, there is a lane to pay and there is a lane to bypass the toll booth. Paying the toll is not required if you simply plan to sightsee and/or visit the town of Summerhaven.